Junk food, cube-shaped chickens or radioactive apples. For a long time people couldn’t care less. The last few years that’s shifting though, consumers are becoming more aware of what they eat. You might already have noticed a trend in shops trying to sell you all kinds of organic stuff, some of them from an ideological point of view, all of them for ridiculous prices. It seems that we have to chip in to save the planet! Ridiculous right? For all the people out there who agree that buying off your bad conscience isn’t the way to salvation, here are some creative solutions. Whoever thinks that gardening is only for the elderly, is terribly wrong. Last month, Stichting Stadsboeren (the city-farmer foundation) organised the Bellamygarden festival. Funny thing was that lots of attenders didn’t fit the stereotype of being a dusty and old recreational farmer. Thomas le Gras, one of the festival organizers, endorses that more and more young and hip people are getting jiggy with ecological stuff. Although Thomas was always aware of the damage we do to the earth, he did get a bit of a push to really start an initiative to change it. 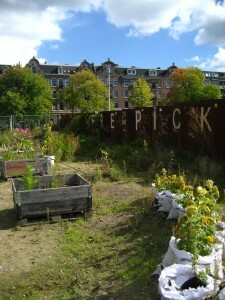 He got in contact with the originators of the Bellamy Garden in Amsterdam-West, and got addicted to the idea of creating a place where people can grow their own food. Gardening connects people and causes more awareness about food and a greener city. Nowadays he runs the garden together with two friends: Hidde Suvaal en Koen Backer van Ommeren. There’s lots of wasteland in Amsterdam so luckily the guys are full of ambition to do something with it. Within five years they want to be able to live of their foundation, deliver city vegetables to Amsterdam restaurants and keep chicken and bees as well. 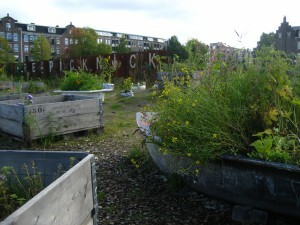 Stichting Stadsboeren makes kitchen gardens of unused sites in the city. The ground is usually full of poison, so they fill wooden crates with fertile ground. An advantage of that method is that they can move the operation any time they want. People rent a crate for 40 euro a year and you also get a sowing course so you can actually make something of it. 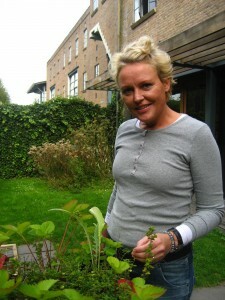 Inge van der Feltz is also a pioneer in the field of private food production. With her Moezziez, ‘kitchengardenbags’, she wants to make sure that everybody can grow their own food the whole year through, wherever they want. Home-growing your food, makes organic food affordable and that’s not an unnecessary luxury during the economical crisis. You don’t have to be a farmer to grow your own food. The fact that being conscious about nature is trendy wasn’t the most important reason to start with the mobile gardens. Healthy food and being outside are ‘in her soul’ as she phrases it. 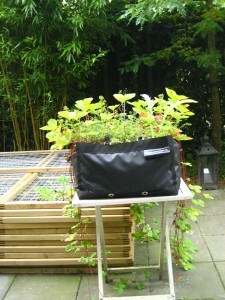 She got fed up with ploughing her own garden, so she got the idea to put her herbs and vegetables in a durable bag. Eventually that led to her creating various applications of the garden bags. These applications allow people to grow their food anywhere they want. With Moezziez I want people to rediscover the origins of their food and give more colour to the city.